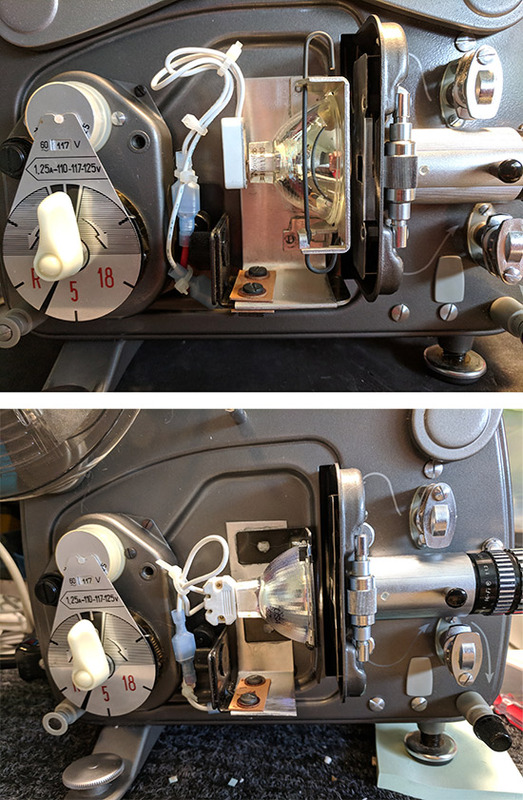 I finally got around to converting the lamps in my two Bolex 18-5 Standard 8mm projectors. I was hoping to use a QLV-1 holder for the standard 8 projector, but it was too wide. The cover would not not close down all the way. So I took out the bulb holders from 2 spare parts machines. They were from different projectors, but both would fit if I could somehow mount the holder flush up against the front wall of the casing. I removed the old bulb and cut the wires to the base by unscrewing the 2 screws to disassemble the base. I also removed the pins from the base that held the old bulb in place. I positioned the new bulb holder as close as I could get to the gate then tested to see if the cover would fit. 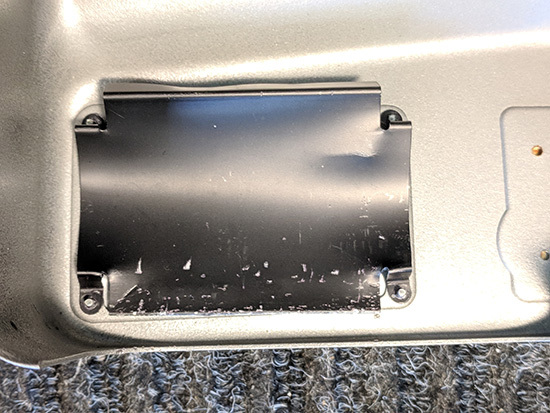 I ended up having to bend the heat guard on the cover and flattening it on one side which allowed the cover to fully close with the holder in place. Next I cut a piece of sheet metal and bent it to go over and under the old base. I drilled 2 holes in the sheet metal to line up with the holes in the base. I would attach the lamp holder to this piece of sheet metal. Next I used E6000 glue to attach the lamp holder to the sheet metal and clamped it while drying. Then screwed the base elements back together which now included the sheet metal. I had one ceramic lamp socket from another projector, but I had to buy a second socket off Amazon. As on my other conversions I attached the socket to the power wires using shielded connectors. After inserting an EFM bulb the conversions were complete. Nice DYI Janice! The final results look really well done! It's rewarding when these types of conversions actually work. I bet those projectors throw a nice bright image? Thanks Shane. I've been waiting a long time to figure out a lamp conversion for the Bolex standard 8mm projector. No more spaceman bulbs. 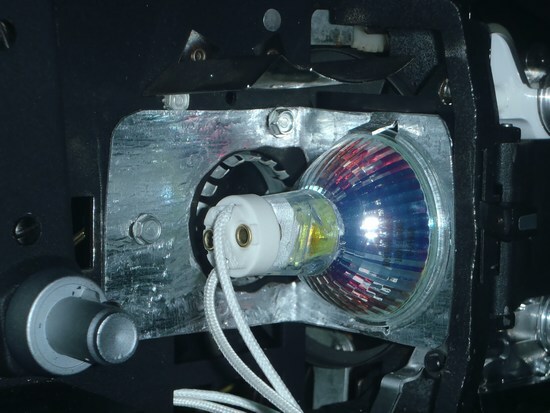 I never had an issue with the brightness of the CXR bulbs...just the replacement cost. Both the CXR and the EFM bulbs are 50 watts so I don't see much of a difference in brightness, however it's much cheaper to maintain with the EFM. I also don't see any reason using this conversion design wouldn't also work in the 18-5L model. Very Good Job , congratulations ! Not to hijack this thread but does anyone know if there are ways to upgrade the transformers in these projectors and others? Let's say you wanted to upgrade from 50 watts to 100 watts. Or in the case of my Sankyo 2000H from 100 watts to 150? Has anyone successfully done this? @Shane...probably best to open a new thread to keep this focused on the lamp conversion. @ Phil...Thank you. I'd be interested in hearing if anybody tries something like this. 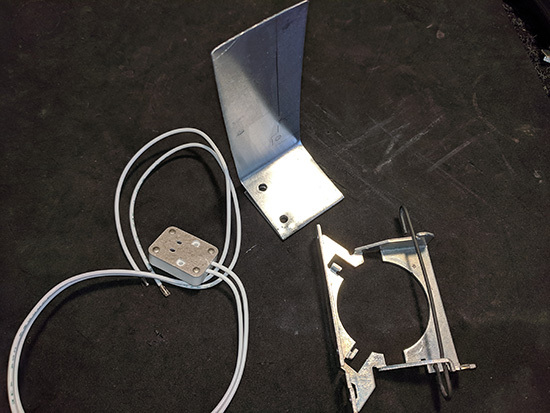 I also wanted to add that it's important to use a non-flammable heat resistant glue when attaching the lamp holder to the sheet metal. I don't know how hot the lamp area gets. On the first conversion I used Gorilla Glue. It's non-flammable after setting and heat resistant up to 230F. On the second conversion I used E6000. E600 is non-flammable and heat resistent. It also doesn't expand like Gorilla Glue does. Hello: I have a Bolex 18-5 first generation with the flat belt. 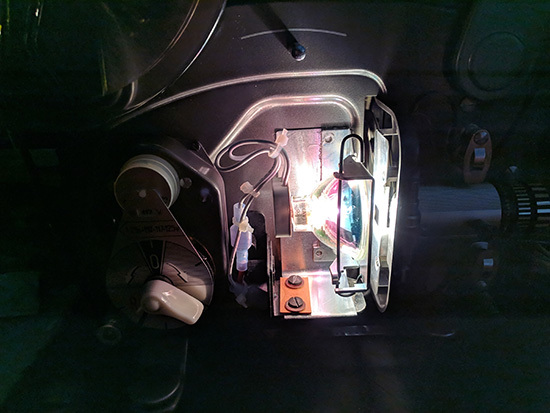 As I do not have the machines that you have removed the the new lamp halogen holder, is it possible to utilize the QLV-1 holder by cutting some off the side? Great job on your conversion by the way. That is an excellent conversion, Janice! E6000 is an industrial strength glue popular with jewellers apparently. It's as cheap as chips on eBay. Much easier than nuts and bolts or welding. Hi Steven and welcome to the forum. If you can trim a QLV-1 down then possibly it would fit. You would have to position it with the bulb removed and measure it to see how much and where you can cut it. The QLV-1 metal is very strong and I don't have anything that would cut or grind it down. If you have the proper tools let us know if it worked. Thank you Janice: I will keep you updated. I have this machine with the qlv-1 installed. Like Janice says, the edge of the bracket needs to be slightly shaved else the cover will not shut completely. I still have yet to finalize the 'shaving' stage on mine as i haven't figured out a good way to do this, so am interested if anyone is successful. I like your home made bracket system better Janice and may retrofit one day to match! Hi Matthew... If you can remove a lamp holder from a junker projector this is an easy conversion. However if no spare holder available...you might try making a holder. Take a look at Manuel Tappia's thread. He fabricated a holder from sheet metal. Manuel used screws to attach his holder, but my gluing solution would work the same. Sheet metal is pretty easy to work with...just get a pair of sheet metal shears and give it a try. You can buy 12"x12" squares of galvanized sheet metal at HomeDepot. Cutting a hole in the sheet metal for the bulb would be the most difficult part. Would perforated sheet metal be a better option I wonder? If you can anchor the sheet metal securely the hole shouldn't be a problem. 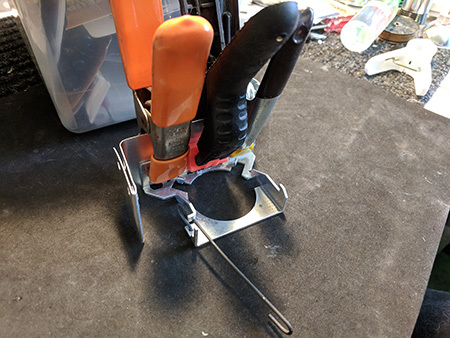 I'm thinking of nailing or screwing the sheet metal to a larger piece of wood clamped down to a workbench or just standing on it...drilling a small pilot hole in the center, then using a hole saw drill bit to slowly cut the opening. Does that sound feasible? That sounds a good plan, Janice. You'd need a hole saw bit suitable for metal (some are for wood or plastic) but these are readily available on eBay. They're not cheap but, given the cost of the original bulbs, could be a good investment. Thanks. 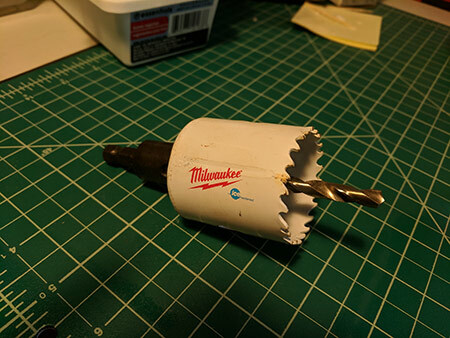 Milwaukee tools are sold in the UK but I don't know if that bit is available. There are several similar ones on eBay for around the same price. I have a couple of Sankyo Dualux 1000s and an Eumig 501 using the A1/17 CXR/CXL "Spaceman" bulb. Sadly, there's no room for Manuel's solution with either models. I've experimented with a different conversion for the Sankyos, though. I need to get down to finishing it. Will...There is a Sankyo Dualux 1000H model that has the newer halogen bulb. Perhaps someone who has one of these could post a picture so you could see the holder used in it. There are pictures on the Van Eck Video Services site. The bulb is held in a custom, mild steel holder bolted to a new base plate. It seems that to make room for the bulb, there isn't a cover over the fan pulley. It looks as if this was removable on later 1000s. On both mine though the cover is an integrated part of the casting. The 1000-H model is pretty rare. I've only ever seen one advertised on eBay.